Outstanding achievements by our Lower Primary students in both Bright Minds Lapbookers and Chinese Lapbookers classes. Rulang, Methodist Girls, Anglo Chinese, Raffles Girls, CHIJ St. Nicholas, Woodgrove, Punggol View, Westwood, Maris Stella, Singapore Chinese Girls, Ai Tong etc. What does it take to consistently score A* (91% and above) in Primary 5 & 6 English exams? Besides some hard work, there are a few more important factors that I will elaborate in this post. Those who know me will know my children do not attend tuition classes. They attended my Bright Minds Lapbookers programme during their preschool years. During their lower Primary years, I coached them using the same methods at home in just 1 to 2 hours a week, as I did not conduct any Primary Years classes then. By the time they reached Upper Primary years, I only stepped in to close any learning gaps identified during the revision period before an Exam. This is possible because of the strong foundation and skills we started building since their preschool years. In this post, I will reveal some of the secrets that make a difference. By the time kids reach Upper Primary years, it is common to see students complete between 5 and 8 assessment books in a year, just to master the English subject. Usually parents would buy new assessment books when they realized the child was weak in a certain area. Just imagine completing 100-150 pages of 8 books, each specializing in a certain aspect of the English exam (from Grammar, Vocabulary, Cloze Passages, Comprehension, Graphic Stimulus, Synthesis & Transformation, just to name a few...) just for ONE subject! Most of these kids would have also spent countless hours doing past-year exam papers at home for English. These extra hours are put in ON TOP of the hours spent on completing school work. No wonder many Upper Primary students are stressed! In the end, most kids still score a C, B or a low A grade (below 80%) for English. Why? The irony is those who have consistently scored A* would have completed just one assessment book or even none at all! What is their secret? Scoring A* in Upper Primary needs MORE than just hard work. Studying smart is just as important. With effective learning strategies, it is entirely possible to spend only a little time to learn what's required to ace the exams. Assessment books and exam papers have a purpose to serve - they are tools to use to TEST a child's current ability. They offer parents/teachers/students feedback to let us know what the child knows/does not know and where the learning gaps are. That's it. (2) uncover the real cause of that mistake and seek to close that learning gap? Many have the mistaken belief that once the child is given the correct answer, the learning is complete. This is not always the case. The child would have ONLY learnt the correct answer to THAT SPECIFIC question. Without knowing the real cause of that mistake, and doing something about it, the same mistake may be repeated. Effective coaching will make a big difference in ensuring the child really learns from the mistakes and never repeats them. 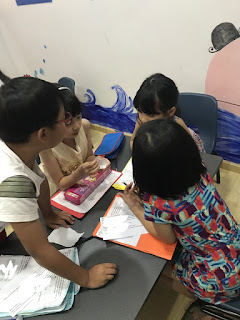 If kids already have a weak foundation in the English language prior to the Upper Primary years, just doing tons of assessment books, worksheets and exam papers can help the child, but only to a certain extent. Achieving excellence in exams is akin to building a house. Without laying a strong foundation, no matter how fancy your tools are or how dedicated you are when you are constructing the upper levels, the house will collapse. It is a misguided belief that a child with poor English standards in earlier years can easily catch up in Primary 5 and Primary 6. 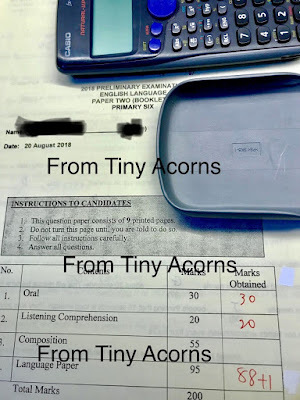 A child who has not mastered the content taught up till Primary 4 and lacks the essential skills, may find it an uphill battle just to achieve a C or B grade in the PSLE. A child who scores above 90% in Primary 1 and Primary 2 school exams, or even in Primary 3, may not attain A* in his upper primary years. Though he would have a better chance than others to secure the A grade (75% to 89%), it would not be a walk in the park either. Like all subjects, in the Upper Primary years, there is advanced content to learn and more difficult skills to hone. On top of that, the child must possess excellent learning attitude, habits and mindsets. Lower Primary syllabus does not expect children to possess strong critical thinking and communication skills to excel. Hence, it is possible to drill kids to do hundreds of grammar, vocabulary and comprehension questions to excel in exams. However, those with strong skills in these areas have an upper hand, as long as they continue to improve on their skills, in addition to mastering the new content. In the Upper Primary years, those with weak foundation and also lacking in strong critical thinking and communication skills, will see a 20% to 30% drop in overall marks. That is usually when kids and parents will panic. Skills take years to hone and it is always tough for school teachers to do enough to help everyone to reach the desired level of proficiency. There is limited time each day to give 1 to 1 attention to a class of 30 or more. With MOE's newly announced changes of doing away with several exams, it will be harder for inexperienced parents to ascertain a child's real standard in lower Primary years. Class tests are usually topical, shorter and simpler than exams. The latter covers months of content and would be pitched at a higher level to sort children into different groups of abilities. 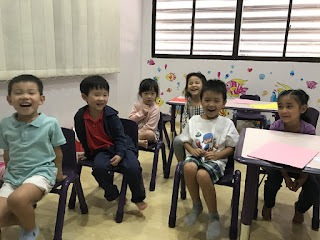 Even though the PSLE grades should not define a child, and we should not emphasize grades over and above everything else, as a parent and educator, I believe it is entirely possible to attain good grades without crazy level of stress. Academic achievements and happy childhood need not be mutually exclusive either. This is possible for everyone. It begins with the right steps. Children between 3 and 5 years old are tirelessly learning all the time. They talk non-stop with an expanding vocabulary. They are constantly on the move and more curious than ever about the unknown. They ask hundreds of questions each day and are impatient and hungry to know more. They look up to older children and instinctively wish to emulate their behaviour. This is the period of their young lives when exposure to a nurturing and effective learning environment is the MOST important. Your every decision on your child's learning journey at this point has a positive or negative impact on their learning journey. Some decisions may be catalysts that stimulate growth and accelerate learning. Others may hide your child's potential and hinder growth. This is also the period when they are learning to form Positive Attitudes and Core Learning Skills that are essential to transform an average learner to one with high abilities. In our Bright Minds Lapbookers classes, every 3 to 5 years old student has an individualised learning path mapped out. Parents are updated of their child's strengths and weaknesses as they progress in our programme. Suggestions on how parents can reinforce learning is provided weekly so parents can effortlessly create an effective learning environment for their children. 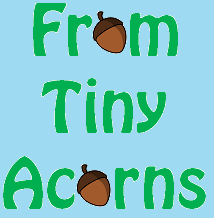 Email from-tiny-acorns@hotmail.com to learn how our Bright Minds Lapbookers programme can stretch your child's abilities and accelerate his learning.